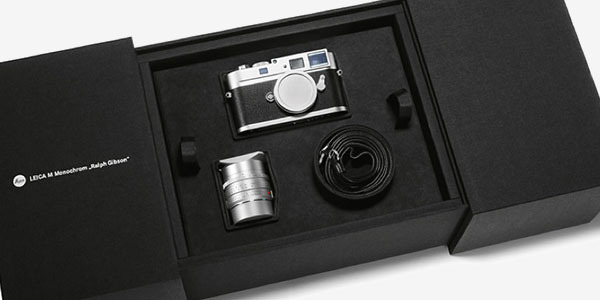 In close cooperation with Transcontinenta, the Leica importer of the Netherlands, Leica Camera AG and top photographer Ralph Gibson, New York, will offer an exclusive limited edition of only 35 pieces of the Leica M Monochrom. Over more than five decades, for internationally renowned Leica photographer Ralph Gibson, the analog Leica M cameras used to be final the final answer to art photography. In his eyes, digital black and white did not measure up to the quality of analog. However, after he had tried a standard Leica M Monochrom, Ralph was so convinced of the unprecedented quality that comes out of this camera, that he has since been using the digital Leica M.
The Leica M Monochrom "Ralph Gibson 'is characterized by a unique personal design of both camera body, lens and leather camera case in premium finishes. This exclusive set is manufactured in a very limited edition of only 35 pieces. The very luxurious camera set also includes an autographed black and white photo and a limited edition of Ralph Gibson's new book, which is aptly called "MONO". The first Leica M Monochrom "Ralph Gibson 'will be handed over personally. The special date '11-12-13' in the Leica store in Lisse, Ralph Gibson will be there during the week from December 9 to 14 and will provide various lectures in response to this unique introduction at that time. He will also attend the world premiere of the "MONO" exhibition in the Kahmann Gallery in Amsterdam. Leica cameras and its users deserve special attention which is best reflected in the unique store concept of the Leica Store. On more than 80m2 one can fully enjoy the passion for quality and customer focus. Besides the latest Leica cameras there are also very special historical and limited edition Leica cameras in the Leica Store Lisse. Leica is not just a camera. The Leica Store Lisse informs its customers about the special properties of a Leica and guides them to the right choice. Quality is paramount at the Leica Store Lisse. However, not just the quality of the camera, but also information and service. The Leica Store Lisse regularly offers lectures, training and workshops organized by and for professional photographers. This is the only Leica store in the Netherlands, located in the Kapelstraat 3, 2161 HD Lisse. Tel: 0252-415349. At 22 Ralph Gibson (1939, USA) got his first Leica. He learned photography in the U.S. Navy and became a photo journalist after a brief study at the San Francisco Art Institute. Soon he went to work on various projects. Gibson began his professional career as an assistant to Dorothea Lange. Not a bad start, especially if you know that he also worked with Robert Frank on two films after moving to New York in 1967. To date he can look back on a fantastic career as a top photographer that has lasted more than five decades. 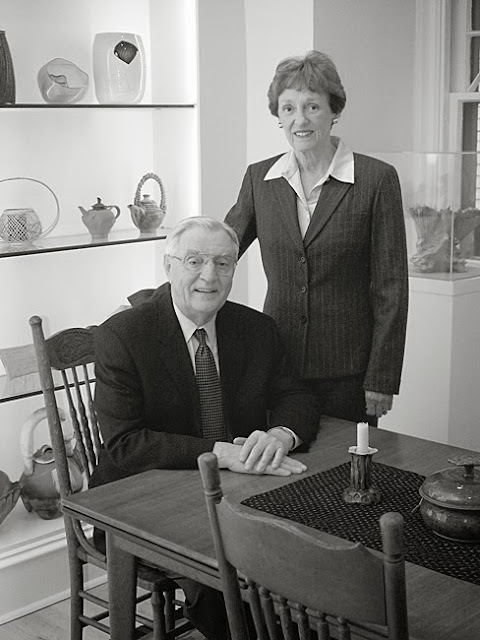 He has received numerous awards, including the National Endowment for the Arts, the Leica Medal of Excellence, the Lucie Lifetime Award and the Silver Plumb Award. He is a Commandeur de l'Ordre des Arts et des Lettres in France and has honorary doctorates from the University of Maryland and Ohio Wesleyan University. Gibson has had hundreds of solo exhibitions and his photographs are included in more than one hundred and fifty museum collections around the world. Leica Camera, in partnership with Miami Street Photography Festival, is launching a series of exciting photographic events and partnerships at Art Basel Miami this December. Dubbed the winter playground of the global art world, the prestigious fair annually hosts over 50,000 international art enthusiasts who come to enjoy the fascinating exhibits, events, and programming against the vibrant backdrop of Miami Beach. To celebrate photography on a global platform, Leica and Miami Street Photography Festival will offer photography workshops, lectures and exhibitions, joining with a host of partners such as Leica Akademie, Leica Store Miami, ONA, Image Pro International, Art Media Studio, Hanhemuhle FineArt and Gramps Bar. Trendy Studios in Miamis bourgeoning Wynwood Art district will be the hub of Leica events and partnerships during Art Basel, December 2rd - 8th, 2013. Named as an "Art Basel Top Ten" in Harper's Bazaar Hotlist section in its inaugural season, programming will take place at Trendy Studio in Miamis vibrant Wynwood Arts District. Featured speakers include world-renowned Magnum photographers Alex Webb, Bruce Gilden, and Constantine Manos, along with poet and photographer Rebecca Norris Webb and National Geographics Maggie Steber, who will be holding photography workshops throughout Art Basel. Leica Akademies goal is to increase the fun and enjoyment of photography, expand photography knowledge and bring the total Leica experience to a new generation of photographers. Heres your chance to experience the incomparable Leica M typ240, the newest full-frame interchangeable lens professional digital rangefinder camera. This full-day, hands-on experiential program is geared to present and prospective M owners, and includes a workshop providing a comprehensive introduction to the M and 2-hour field trial. 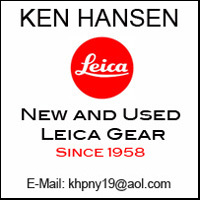 All programs are lead by friendly, knowledgeable Leica Akademie instructors. Sunday, December 8th, 10AM - 5PM. Leica Store Miami, located at 372 Miracle Mile in Coral Gables, will host an opening reception for an exhibit entitled Together and Apart by Alex Webb & Rebecca Norris Webb, on Tuesday, December 3rd at 7 PM. Leica invites Art Basel attendees to be part of a living art exhibition on Thursday, December 5th. Celebrity photographer Mark Mann will be taking portraits of participants using the Leica S from 10am-4pm at Trendy Studios. The on-site printing of each image is supported by Image Pro International and print specialists Gady Alroy, of Art Media Studios, and Sean Black. The portraits will be printed on Hanhemuhle FineArt photographic paper and displayed outdoors across the entire Trendy Studio space to create a living street art exhibit that will be in constant transformation as each new image is added. The exhibit will remain hanging for the duration of Art Basel, capturing a unique moment in time at this years Art Basel. All attendees who pose for a portrait will be given digital copies. Think color, think spirited, think unconventional and artsy...you must be thinking Wynwood, Miami's vibrant art district that pulses with energy and creativity, day and night. Wynwood is the soul of Miami's urban renaissance. It can be sophisticated or it can be eccentric. It can be teaming with life, or it can be a calm Sunday stroll. With its street art, galleries, restaurants, and throngs of diversity, it is the place to be in Miami, and a truly desirable place for any street photographer in search of "the moment". Come join us on Saturday, December 7, at 11:00 a.m., as we use the streets of Wynwood as our palette for this year's photo walk. Participants will have the option to test Leica cameras throughout the morning's activity. What could be better than enjoying one of the world's premier art districts with a Leica in hand?! This guided event is free to the public and all levels of experience are welcome. Bring your own camera or borrow a Leica. Participants will gather on the sidewalk adjacent to Trendy Studios at 196 NW 24th Street. Members of the Miami Street Photography Club will be on hand to serve as guides and answer questions. Let us know that you're coming by sending an email to: info@miamistreetphotographyfestival.org. On December 6th, from 12-4 PM the "Leica X Vario City Challenge" makes a final splash in Miami following successful turnouts in New York, Washington DC, and Los Angeles. Leica fans can participate in this photo competition for the chance to win a Leica X Vario among many other valuable prizes. 30 lucky participants in each city are invited to shoot with a Leica X Vario for 4 hours during the City Challenge. Sign up quickly, be creative, select your favourite image, and submit it to the competition. The Leica Camera AG, Solms, has taken over the he Swiss manufacturer of professional cameras, Sinar Photography AG, Zurich on Monday. Both companies have agreed not to disclose the details of the transaction. Sinar Photography AG is the leading manufacturer of cameras for professional photography. As the only supplier in this segment, Sinar offers digital ready solutions for professional photographers from cameras, lenses, digital backs and shutter systems to workflow software. Marketing, product management, support, development and production of Sinar remain in Switzerland. Sales will be handled in the future by the Leica Camera AG, as well as through the worldwide dealer network of Sinar Photography AG. Thus Leica Camera AG enhances its offering in the high-end digital camera segment and further expands its position in the market for professional photography. 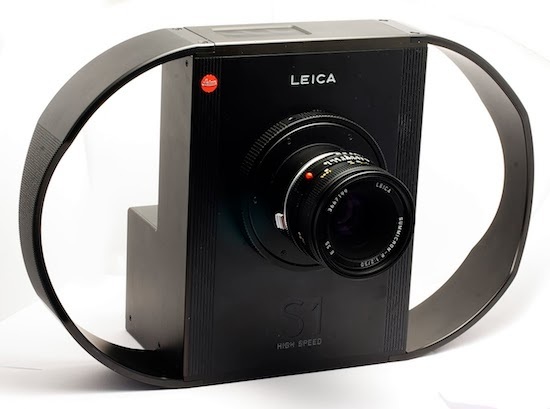 According to their own philosophy Leica offers the Leica S-System as a highly mobile, integrated medium format system, which now has a perfect complement in the modular and particularly suited for studio, industrial, and architectural photography Sinar system. Synergies also arise in the areas of digital technology, sales and customer care. Leica now offers a complete range of high end medium format and digital professional cameras, making them the only provider of complete digital camera solutions above the Leica 35 mm format. Both brands are known for the highest quality standards and their decades long tradition of professional photography, in which the best picture and the photographer are the focus. This makes Leica the only camera manufacturer to offer not just digital equipment but also film cameras in 35mm, medium and large format photography. Here is the German press announcement. Die Leica Camera AG, Solms, hat am Montag den Schweizer Hersteller für Fachkameras, die Sinar Photography AG, Zürich, übernommen. Über die Einzelheiten der Transaktion haben beide Unternehmen Stillschweigen vereinbart. Die Sinar Photography AG ist der führende Hersteller von Kameras für die professionelle Fachfotografie. Als einziger Anbieter in diesem Segment hält Sinar digitale Komplettlösungen für Fachfotografen von der Kamera über Objektive, Digitalbacks und Verschlusssysteme bis hin zur Workflow-Software bereit. Marketing, Produktmanagement, Support, Entwicklung und Produktion von Sinar verbleiben in der Schweiz. Der Vertrieb wird künftig über die Leica Camera AG sowie über das weltweite Händlernetz von Sinar Photography AG abgewickelt. Die Leica Camera AG vervollständigt damit ihr Angebot im Segment der digitalen High-End-Kameras und baut ihre Position am Markt für Berufsfotografie weiter aus. 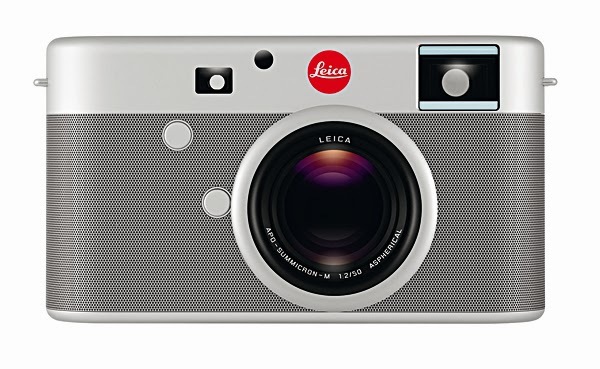 Leica bietet mit dem Leica S-System gemäß der eigenen Markenphilosophie ein sehr mobiles, integriertes Mittelformat-System an, das nun in dem modularen und besonders für die Studio-, Industrie-, und Architektur-Fotografie geeigneten Sinar-System die ideale Ergänzung findet. Synergien ergeben sich auch in den Bereichen Digitaltechnologie, Vertrieb und Kundenbetreuung. Leica hält nunmehr eine vollständige Produktpalette von der Mittelformatkamera bis zur digitalen Fachkamera parat und ist somit einziger Komplettanbieter digitaler Kameralösungen oberhalb des Leica Formats 35 mm. Beide Marken sind bekannt für jeweils höchste Qualitätsstandards und ihre jahrzehntelange Tradition in der Berufsfotografie, bei der das beste Bild und der Fotograf im Mittelpunkt stehen. Leica has often been criticized for not having paid enough attention to digital photography, that a few years ago they fell hopelessly behind their competition. Yet in all this criticism one fact is getting lost these days, the fact that already in 1996 Leica introduced a high resolution digital camera, the Leica S1. We must remember that this was at a time when 2 to 3MP digital cameras that took pictures of questionable quality were the norm, the days when film photography was still way ahead of digital and when the Lweica M6 was the best 35mm film camera that money could buy. In view of this, it is all the more amazing that the Leica S1 offered a resolution of 26 megapixels, something that even by today’s standards is very high. How could this be possible? At that time, resolution levels of this magnitude could only be achieved with so called scanning backs. Instead of taking the entire image instantly, as is the norm today, the Leica S1 (as well as other, similar digital cameras at the time) scanned the image line by line. Unfortunately this resulted in exposure times of about 185 seconds. Subsequently the camera was only useful for stationary objects. The camera was designed to capture square 36 x 36mm images using 35mm lenses. Though designed for use with Leica R-series lenses, Leica also offered lens mounts for Nikon, Contax, Canon FD, and Minolta lenses as well as for medium-format optics from Hasselblad and the Pentax 6x7. There was also a Novoflex adapter that allowed the use of large-format lenses from Rodenstock & Schneider, and a tilt-shift adapter for use with Hasselblad lenses. The S1 could also be coupled to the rear of a view camera to take advantage of tilt, swing, and shift movements which further increased the overall versatility of the camera. 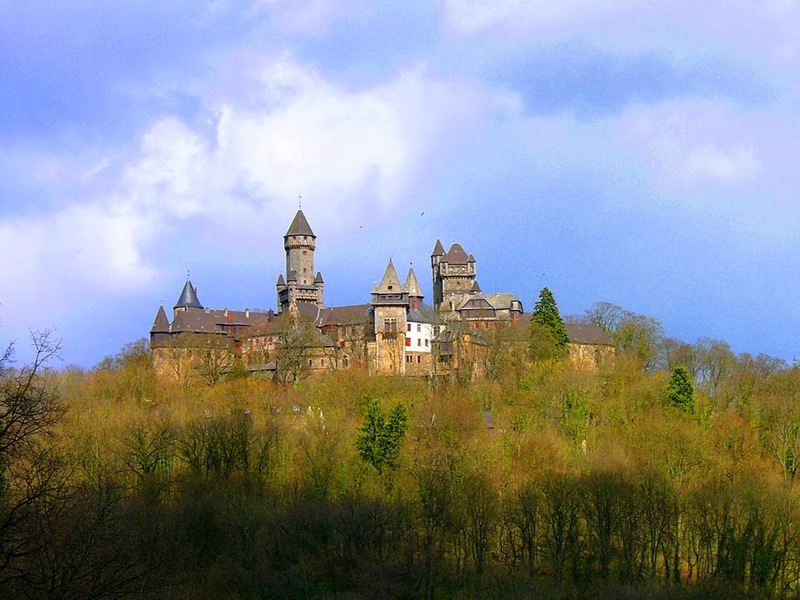 The ISO setting for the S1 was ISO 50, the D-max about 3.3, and the image files contained a dynamic range of 11 stops of latitude. At 300 dpi you could produce incredibly sharp 17 x 17" prints without having to interpolate the image, which in 1996 was almost unheard of. All that could be had for the price of $21,500. Needless to say, the camera did not set any sales records. 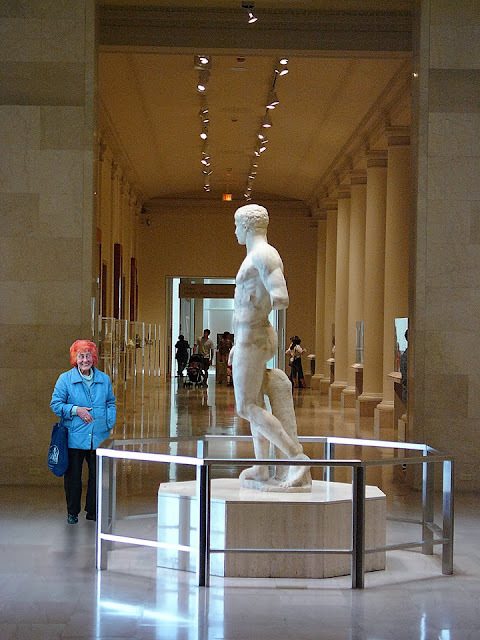 It was mostly sold to museums and research institutions. But it is interesting to think that this level of performance was not available from Leica until the introduction of the Leica S2 in 2008. The Sotheby’s (RED) auction has ended. The custom made Leica M, designed by Apple’s Jony Ive and Marc Newson sold for $1,805,000 at the charity auction organized by Bono od U2 fame. The opening bid had been set at $500.000 and it was thought that the selling price might reach $750,000. Sotheby’s (RED) auction raised a total of $26.2 million to fight aids in Africa. Leica announced price increases on a number of products from the M, S, X, Compact cameras, and Sport Optics lines. The new prices will be effective January 1, 2014. Most dealers will be able to honor the old prices through December 31, 2013 as long as they are in stock and as long as they can be ordered from Leica at the current prices. Leica is often criticized for not offering autofocus for the Leica M. Many feel that this is really the final step necessary to make the M fully competitive with the top models from other manufacturers. Yet it is a actually a little known fact that Ernst Leitz Wetzlar GmbH (the name Leica Camera used to be called) was the first company to develop a working autofocus system. 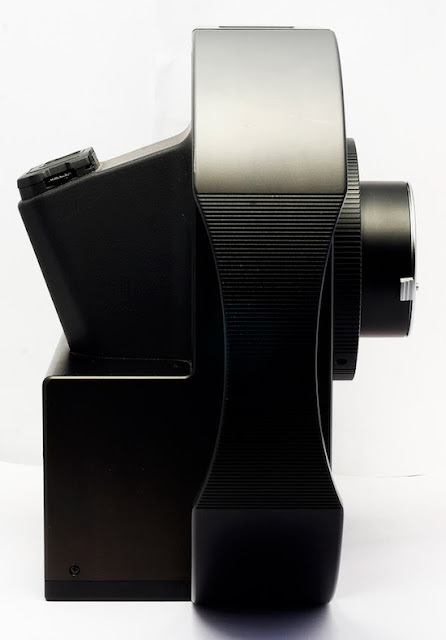 Between 1960 and 1973 the company patented a number of autofocus technologies, and then showed that technology at the Photokina in 1976 and 1978 as the Leitz Correfot. 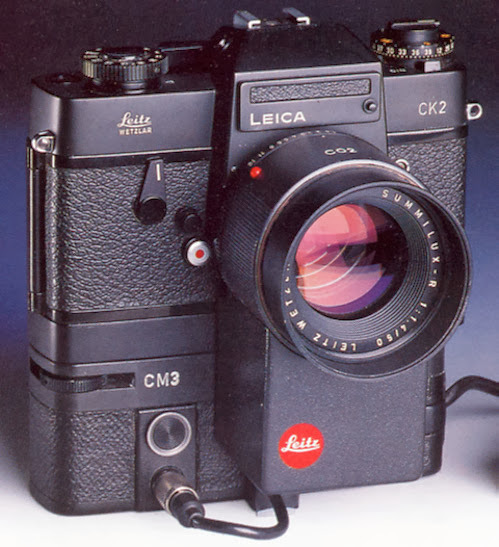 A further improved prototype was shown to the public at the Leica Historical Society of America (LHSA) meeting in Minneapolis in Fall of 1980. The common CdS light meter cells at that time proved to display also a sensitivity to variations in contrast. It is a known fact that an image displays the highest contrast when in focus. By using two CdS cells it was possible to accurately determine the highest contrast level and thus accurate focus. The system was somewhat similar in concept to today's phase-detection systems - except that it required a vibrating diffraction grating to work accurately. 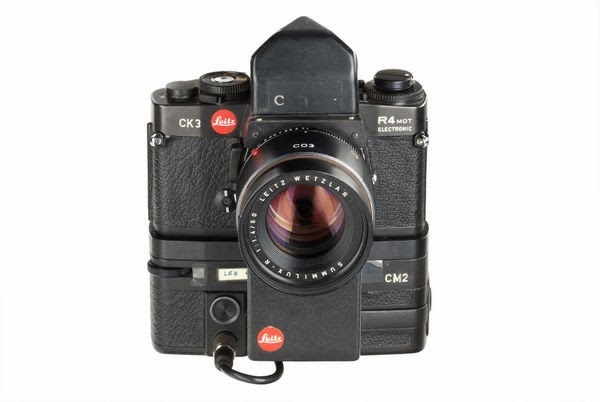 The prototype was a completely operational system built into the shell of a Leicaflex SL2, renamed CK2. All sensors necessary for the automatic focusing were part of the camera. It was designed to use the conventional Leica R lenses on the market at that time. 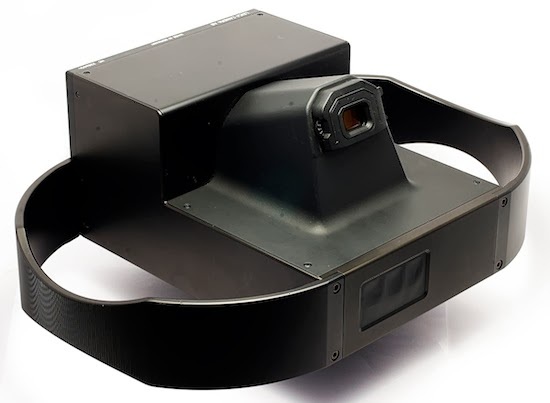 The system required the lenses to be focused manually with the help of focus verification via two LEDs on top of the viewfinder. But like the camera shown at the LHSA meeting in Minneapolis, the Leicaflex SL2 was also shown with a servo motor equipped 50mm f/1.4 Summilux R which provided true autofocus operation and made electronics-aided hand focusing unnecessary. The servo motor was connected to the lens via a gear that engaged with the ridges engraved in the focusing ring of the lens. With other words, it actually turned the conventional focusing ring to effect automatic focusing. Leica chose this approach at the time because they felt it was necessary to utilize their very precise focusing mounts to maintain the mechanical and optical integrity of their lenses. 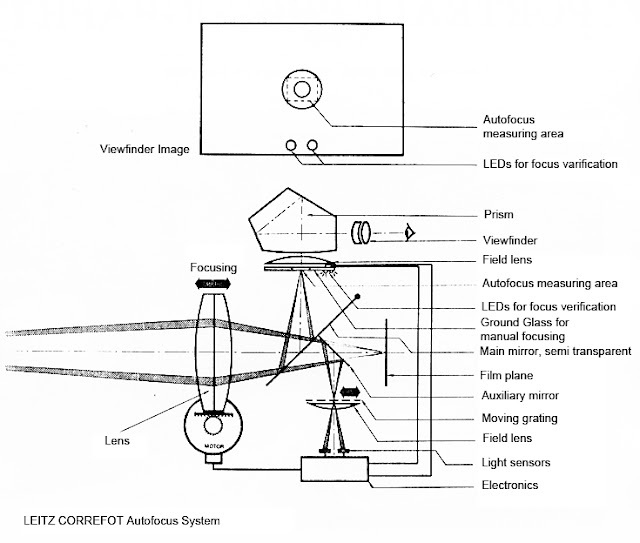 At that time it was generally thought that autofocus systems suffered from low-light insensitivity. However, I personally was able to verify that the system worked perfectly in even very low light conditions and no manual refocusing was necessary at all. However, the camera did display one serious drawback, very high power consumption. The prototype’s servo motor used lots of energy which was supplied by a battery pack attached to the bottom of the camera. It was made from the housing of a Leica R3 motor drive unit. The six batteries proved to be good for only one hour of operation. Careful inspection of the lens revealed meter couplings for the Leica R3 and R4 cameras. These were utilized in a follow up model, based on the Leica R4 Mot prototype with special Correfot prism. In 1983 Nikon presented an evolution of its flagship camera, the Nikon F3AF with its viewfinder DX1 and its two lenses, AF 80mm f2.8 and AF 200mm f3.5 ED. 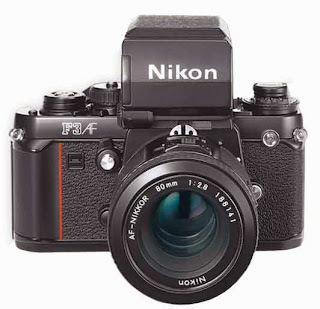 Although never officially confirmed, it is said that Nikon purchased the manufacturing rights for the Correfot prism from Leitz to develop the F3 AF. We must applaud Leitz’ decision not to forego their standard focusing mount for the flimsy autofocus systems that were marketed in the 80s and 90s. Virtually without exception, those were so loose that the moving section of any of those lenses could easily be wiggled back and force by a considerable margin. That of course is far removed from the 1/100mm (1/2500 inch) precision of the Leica focusing mounts. Other companies chose that approach because it was the only means at the time to make the focusing parts of their lenses move easily enough to allow the use of rather small autofocus motors with low enough power consumption to make them practical with common use. Unfortunately Leica never marketed their autofocus cameras thus missing out on having been the first company to do so. That honor goes to Minolta, who introduced the Minolta 7000 in 1980. At that time Leica had a technology exchange agreement with Minolta. The Minolta 7000 would have never seen the light of day without the Leitz Correfoot technology. Although it never made it into production, it appears that the Correfot serves its duty in the German Leopard tanks to this day. Leica Camera invites you to spend an evening experiencing the Leica S-System. 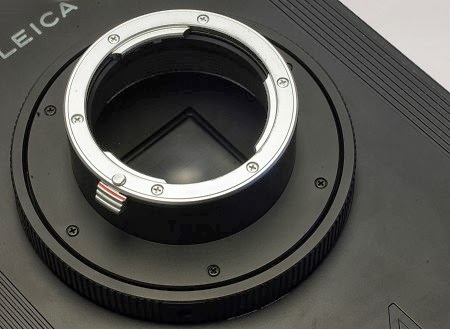 Designed from the ground up, the Leica S is the only medium-format camera to have the sensor and lenses engineered together for full optimization. With its unmatched ergonomics and most precise Auto Focus, the S is the perfect tool for shooting in studio, but with over 35 weather seals and 1,000 shots per battery charge, it is also ideal for travel and location use. Representatives from Leica and Foto Care will be on hand to demonstrate more of the camera's unique capabilities. World-renowned photographer Mark Mann will speak about his career and be available to answer any questions. Mark's editorial work has appeared in such publications as Men's Health, Esquire, Vibe, Spin, Fortune, Billboard, Parade and Complex, among others. He has shot countless celebrities, sports figures and musicians. In addition Mark has amassed a sizable advertising portfolio with work for clients such as Reebok, Hennessy, Pepsi, Chrysler and more. One lucky attendee will have the chance to win a Leica X-Vario (a $2,850 Value). When: December 18, 2013, 7:00 to 10:00 p.m.
Mark Mann will speak from 8:00 to 8:30 p.m.
Space is strictly limited. RSVP now to secure your place. 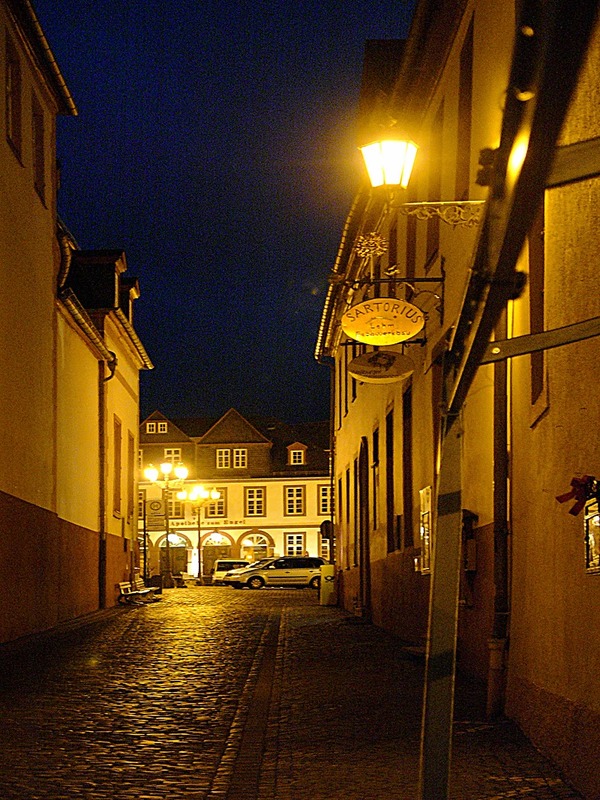 Solms, Germany (November 20, 2013) – Leica Camera is pleased to announce its collaboration with Gagosian Gallery on the new-limited edition Leica X2 Gagosian Edition. Leica is known by photography professionals, aficionados and amateurs alike, not only for its expert technical craftsmanship and stunning design, but also for a history of partnering with the world’s best brands to produce one of a kind, limited-edition cameras. The new Leica X2 Gagosian Edition camera features a robust, all-metal construction. Black paint splotches dot the camera’s high-grip white leather trim in an Expressionist style. Established in 1980 by Larry Gagosian in Los Angeles, Gagosian Gallery has over the last three decades maintained an unparalleled program of exhibitions by the world's leading contemporary artists, presented at its architect-designed exhibition spaces worldwide. Gagosian’s international exhibition and publishing programs parallel Leica’s own global legacy and values of artistic integrity and expressive freedom. We are proud to collaborate with the legendary German photography brand, Leica, in creating this new limited-edition Leica X2 Gagosian Camera” said Larry Gagosian. “Considering the many important photographers who have used Leica cameras over the years, we are thrilled to not only offer Leica products at Gagosian Shop but to have the opportunity to create our own unique Leica Camera." Handmade at Leica’s headquarters in Germany, the compact camera features an APS-C-format professional CMOS image sensor with over 16.5 megapixels, and an Elmarit 24 mm f/2.8 ASPH lens, a classic focal length amongst prime lenses that have captured countless iconic images. Thanks to the ease of switching between manual and automatic control, photographers can concentrate completely on their subjects and choosing the decisive instant to shoot. A pop-up flash further enhances the versatility of the camera in all shooting conditions. Upon entering the Gagosian Shop on Madison Avenue, visitors will quickly notice the vibrant Leica display presenting the new Leica X2 Gagosian Edition. Other Leica products on display include the X Vario, X2, X2 A La Carte, V-LUX 4, D-LUX 6 and Leica C, as well as relevant accessories. Select Leica sport optics are also available. The Leica X2 Gagosian Edition camera, produced in a limited run of one hundred units, is available for purchase exclusively at the Gagosian Shop and on the Shop’s website. 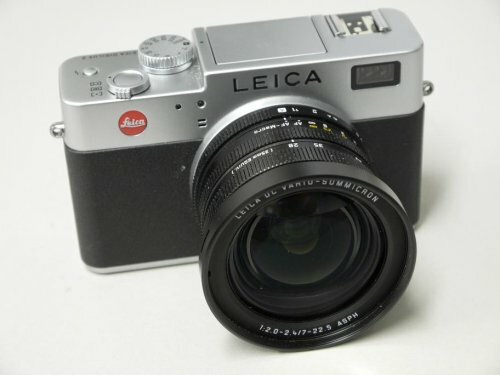 For quite a while now some people have been asking for a Leica mirrorless camera. That request is not without merit. After all, this type of camera has certainly proven itself in many variants from a number of manufacturers, including Leica. Leica could certainly say “been there, done that”. As a matter of fact, they are still doing it in form of the current Leica M. This camera certainly is a mirrorless camera, full frame at that, with interchangeable lenses and a wealth of other features. But it is not the first such camera from Leica. That honor goes to the Leica Digilux 2. It was first introduced in February of 2004, almost ten years ago. As a mirrorless design, the camera featured an electronic viewfinder besides the standard LCD screen in back of the camera. The camera came equipped with a 7-22.5 mm (28 to 90 mm 35 mm equivalent) Leica Vario Summicron f/2-2.4 fixed lens. The sensor has a resolution of 5 megapixels which, by today’s standards is relatively low. But the low resolution belies the actual performance of this camera. Even by today’s standards, the camera is capable of delivering results that easily point to a substantially higher resolution. This goes to the credit of the amazing Vario Summicron lens. It can easily be said that the Leica Digilux 2 is by far the best 5 megapixel camera ever to appear on the market. Unfortunately, the camera has long since been discontinued, but it still has a large following of people that refuse to give it up. Besides the outstanding performance, the camera was obviously designed for former manual camera users. Thus it should come as no surprise that the entire layout of the camera is reminiscent of a Leica M camera. The Digilux 2 features a conventional shutter speed dial as well as standard f stop and focusing rings on the lens. Especially for Leica rangefinder users, the camera is immediately familiar. Even the fell of the camera is very similar and does not require any much getting used to. Of course there are a few modern concessions like autofocus, but manual focus ability is maintained. As a matter of fact, it is possible to activate a magnifying feature which will give a greatly magnified view of the subject matter the moment the manual focusing ring is moved. 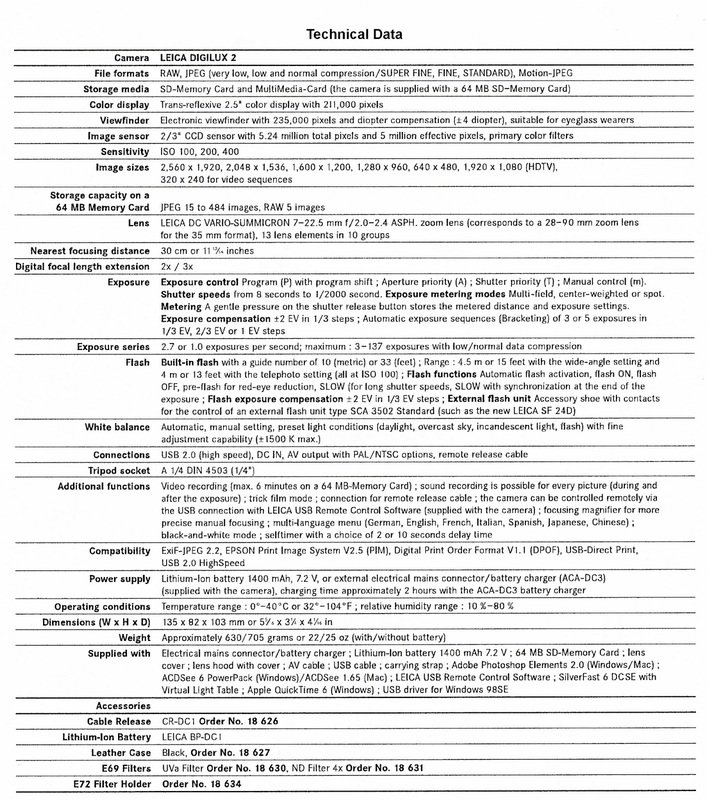 This greatly facilitates the overall accuracy of manual focusing. The camera also has a built-in flash. When activated, it pops up out of the top of the camera. A very unique feature is the two positions of the flash. Initially the reflector stops at a 45 degree angle to allow for bounce flash, a feature that has not to be found anywhere else until the introduction of the Digilux 3. Pushing the flash release button a second time will move the reflector into a standard, forward looking position. 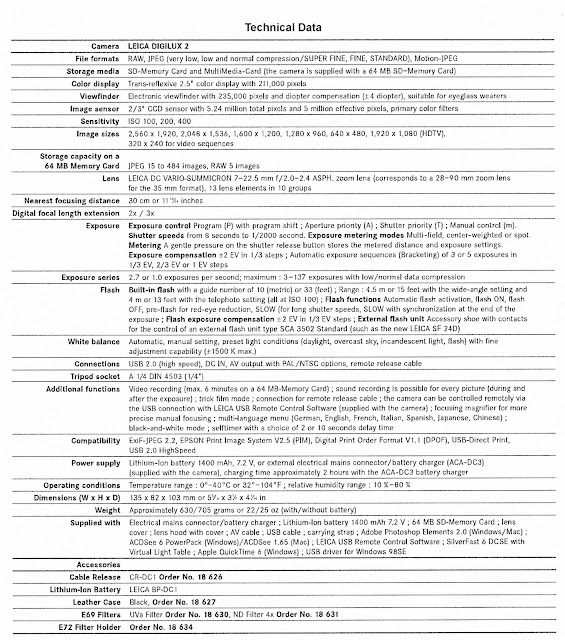 The ISO range of the camera runs from 100 to 400. That might seem inadequate by today’s standards, but considering the rather fast f/2 lens, a camera with an f/4 lens would need ISO 1600 to equal the Digilux 2.